As I go deeper into the Ansible rabbit-hole, I am beginning to look for ways to manage upgrade operations through Ansible playbooks. As part of that journey, I wanted to begin backing up my VCSA and NSX-v VM appliances using their built-in methods prior to executing playbooks to perform the upgrades. Both appliances allow FTP, SFTP or SCP connections through their management interfaces for backing up the configuration data — all that is needed is an endpoint. I wondered if it would be possible to backup these items to S3 using my AWS account. A quick search through my AWS portal showed me that I could use the AWS Storage Gateway, setup a S3 bucket for backups and mount the partition on a Linux VM for the vSphere appliances to use as an endpoint. With minimal effort, I was able to configure both appliances to backup to the local Linux VM and see that data replicated into S3 in a matter of minutes. Fortunately, AWS has outstanding documentation for deploying the Storage Gateway within a vSphere environment (here). Once the Storage Gateway is deployed, the S3 bucket is created and the file share is created you can mount it on a Linux VM. I created a separate backup location on the NFS mount point to the Storage Gateway — one for the VCSA and one for the NSX-v. At this point, it just a matter of configuring the two appliances to use the endpoint. For the VCSA, log into port 5480 over HTTPS and select the Backup option on the left-hand menu. The above screenshot shows how to configure the backup schedule and then you can perform a backup job using those details manually. Similiary, the NSX-v Manager has a Backup and Restore are inside its management interface where you can configure the endpoint. 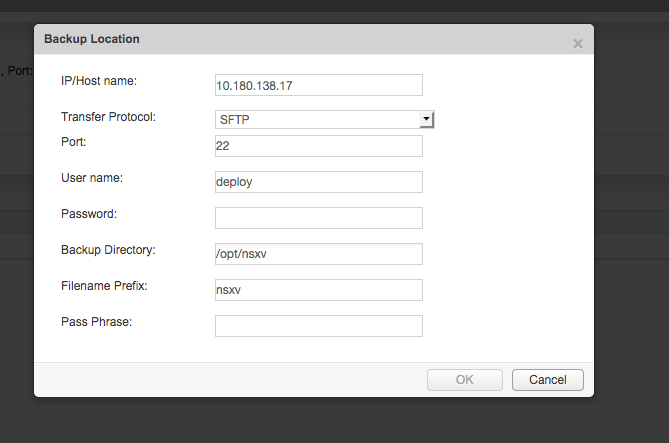 NSX-v only supports FTP or SFTP today, but using SFTP I was able to use the endpoint. Once the backup location is configured, you can execute a backup job through the admin interface. From there it was just a matter of verifying the data was being sent and replicated to the S3 bucket I created in AWS. That is all there is to it! Backups of the appliance data to an AWS S3 bucket using the Storage Gateway is nice and easy. Now I can begin working on the Ansible playbooks to upgrade the VCSA through the API, knowing the data is backed up to the cloud!